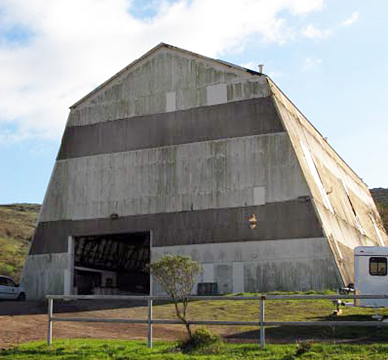 The 1973 and expanded 1979 National Register of Historic Places lists the Fort Barry Balloon Hanger as a contributing feature to the Forts Baker, Barry, and Chronkhite Historic District and on the List of Classified Structures. Originally constructed in 1921, the balloon hanger at Fort Barry is the only surviving hangar of its type that actually housed an army observation balloon. As such, it has a national level of significance for its part in the evolving stories of both coastal defense and military aviation. In 1966, after World War II, the army converted its wartime "combat practice" facilities in the Marin Headlands into horse stables and a riding rink, known as the "Presidio Riding Stables". At that time, the Presidio Stables assumed control of the balloon hanger complex. Vehicle sheds that once housed military jeeps and arms became stalls and tack rooms for horses owned by army officers. The historic Fort Barry Balloon Hanger found new life as an indoor equestrian arena. The hangar's unique architecture was kept intact outside, while the vacuous space inside was adapted to allow equestrian exercises. This unique structure and adjoining stables were subsequently dedicated as "quality of life" recreational facilities provided by the U.S. Army to the Presidio garrison and their dependents. In recognition of the PRC's military roots while upholding our gratitude, our veterans' equine programs strive to "give back" to those who have served their country in wartime and who now find it difficult to reenter civilian life. Just as the PRC has transformed successfully from a wartime facility to a serene peacetime haven, our veterans' equine program helps veterans facilitate their own transformation.